It might not be the big, wooden playset that you’ve had your eye on, but if you have younger kids, a small yard, a tight budget, or all of the above, then you will definitely want to check out the Flexible Flyer Swing N Glide III. This metal swing set will provide hours of fun for the kids in your family who just want to be outside, sliding, swinging, and doing what kids love. The Swing N Glide III is a popular model from Flexible Flyer and almost brings you back to your own childhood with its classic design. 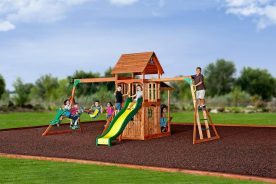 It has 3 of the most popular features that parents and kids look for in a swing set including a glider, 2 swings, and a slide. Its simple design makes it easy to put together for virtually everyone. And its midnight blue and cream color scheme makes it attractive in any backyard. 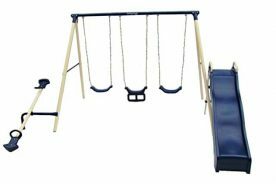 Read on to find out more about what is included with this swing set, where it can be purchased, and how you can put it together quickly and easily. 1 WHAT is included with the Flexible Flyer Swing N Glide III Swing Set? 2 WHO Can Put the Swing N Glide Together? 3 WHEN It’s Put Together, How Big is the Swing Set? 4 WHERE Can I Buy the FF Swing N Glide III? 5 WHY Should I Purchase this Swing Set? WHAT is included with the Flexible Flyer Swing N Glide III Swing Set? This swing set is a pretty basic set, but still comes with enough accessories to keep kids busy and interested. If nothing else, it gets kids outside and moving. They will definitely get the exercise parents want them to have by climbing the slide ladder or pumping their legs on the swings. The structure of this swing set is an A-frame made up of 4 legs. It is constructed of metal that is tubular, making it a fairly light set that can be moved easily if needed. All of the metal parts are powder-coated and painted to help avoid rust and extend the longevity of the playset. Both the plastic and metal components have UV protection to keep them from fading. Since there is not a Swing N Glide I or a Swing N Glide II model, we’re not sure why this set is called the Swing N Glide III. Our only conclusion is that it has three different options for play which are discussed in more detail below. The most unique aspect of this playset is its air glider. Designed to hold 2 kids at once it has two plastic seats and two sets of foot rests. Unlike some other glider swings, kids actually sit face-to-face instead of back-to-back while riding. The air glider swings so smoothly that just one child can easily maneuver on their own as well. 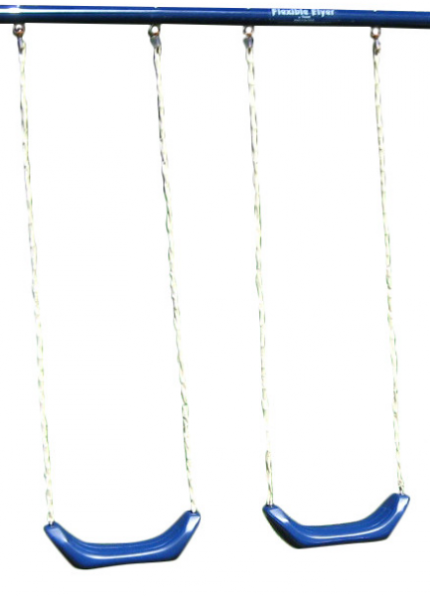 The blue color of the seats matches the blue swings and other blue components. Constructed of plastic, the wave slide is 6 feet long. 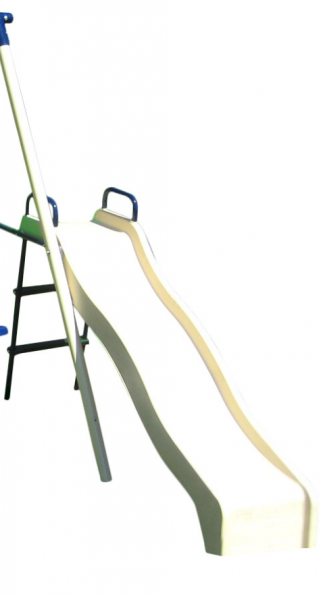 Kids access the slide by climbing the two-rung ladder. The frame of the ladder is constructed of metal to make it more sturdy while the rungs of the ladder and the slide itself are plastic. Unlike the popular metal slides of the past, using plastic keeps slides from getting too hot in the sun. The Swing N Glide wouldn’t be complete without the two swing seats. These swings are constructed of a stiff plastic that provides supports to smaller children without squishing them in the seat. The chains are covered with vinyl to protect fingers from being pinched. While this vinyl is great for safety it does require some cutting and adjustment if you want to lengthen or shorten the chains of the swings. WHO Can Put the Swing N Glide Together? It comes with an illustrated, 20-page instruction manual that explains each step in detail. All of the required parts are outlined on one of the last pages so you can check to make sure you have everything you need before construction begins. As you follow the steps in the manual you’ll find that the parts you will need to complete each step are first presented. Every part is labeled with a part number and size so you can verify you are using the correct piece. The hardware even includes the correctly sized Z-shaped Allen wrench that is required. In the rare event that you are missing any pieces or hardware you can contact the manufacturer directly for replacement parts. They can be reached by phone at 1-888-350-3015 or by email at cservice@flexible-flyer.com. You can also find a copy of the instruction manual here. WHEN It’s Put Together, How Big is the Swing Set? Because of its compact size, this swing set comes in only one box. The size of the box is 87” x 17.5” x 10.8 inches. It weighs 67 pounds and will require two people in order to carry it. Everything required for construction is included in the box. After construction, the swing set will measure approximately 10’ wide x 8’ long x 6’ high and weighs about 63 pounds. Its lightness makes it easy to move if you need to mow around it in your backyard or take it with you when moving. It is recommended that there be 6-12 feet of clearance on all sides for a safety perimeter. While the manual states that this set is designed for kids ages 2-10 years old, its smaller size makes it more usable for kids up to 6 years old. Each swing seat can hold a child that weighs up to 105 pounds. No more than 5 kids should be on the set at a time with a total weight of 525 pounds. WHERE Can I Buy the FF Swing N Glide III? 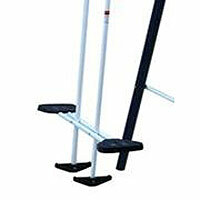 Unfortunately, the FF Swing N Glide III is not found in many retail stores so that you can physically go look at it. However, there are lots of options for purchasing this swing set online and numerous reviews from people who have experience with the set. It is also possible to find several other similar models from Flexible Flyer in stores which will give you a basic idea of its quality and construction. The following retailers sell and ship the set and also provide feedback and answers to questions from other customers. 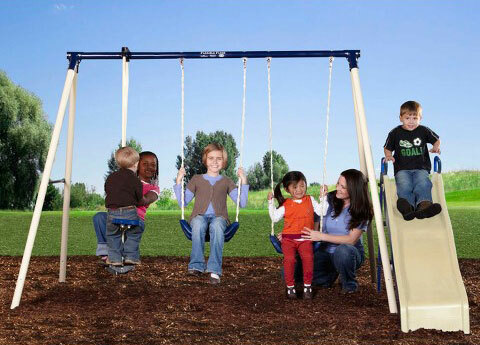 WHY Should I Purchase this Swing Set? If it’s an outdoor playground that you are in the market for then this is not the set for you. But if you are looking for a basic set that even your youngest kids will enjoy, without breaking your budget, then you will definitely want to take a look at this swing set. When you purchase a set from this company you can also be assured that you are getting a quality, made in the US product. Their customer service is fantastic if you have any questions or need replacement parts for anything missing or damaged. With its attractive colors, three options for fun, and easy do-it-yourself assembly the Flexible Flyer Swing N Glide III swing set with play swings, air glider, and slide makes a great playest option for any family.